Simply Good is a website for selling baby products. It is owned by a married couple from Israel. Together with their devoted and experienced employees, their goal is to encourage basic parenting and to simplify parents’ lives. The owners of Simply Good trust us by using our WP Theme – Velo. Simply Good has a clean and simple design. 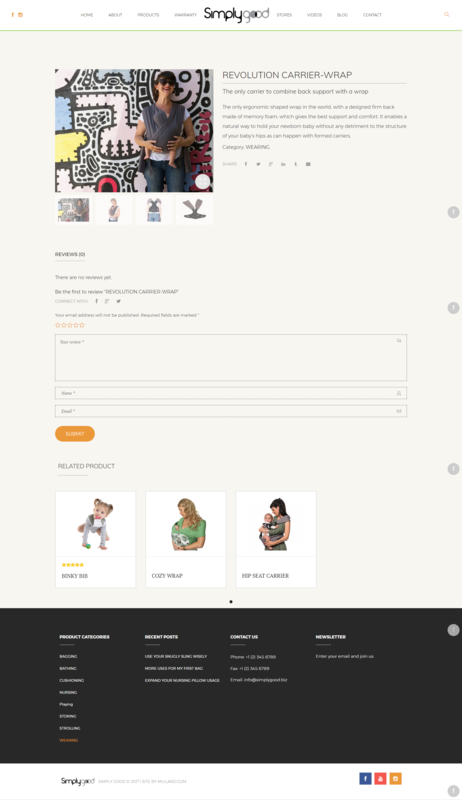 The pre-made layouts and features of Velo, good pixel images and clear organization, these have helped customers easier to find the right products for their kids. To conclude, with great efforts and creative minds, the founding team has been successful in setting a family-friendly website of their own style. Therefore, it is needless to say that their sales will be on the considerable increase.